Many RVers travel with pets, especially dogs. Who doesn’t want to take their four-legged friends with them? They’re a big part of your life, and RVing affords an opportunity for you and them on and off the road. RVs can be outfitted for pets inside and out, regardless of where you travel. 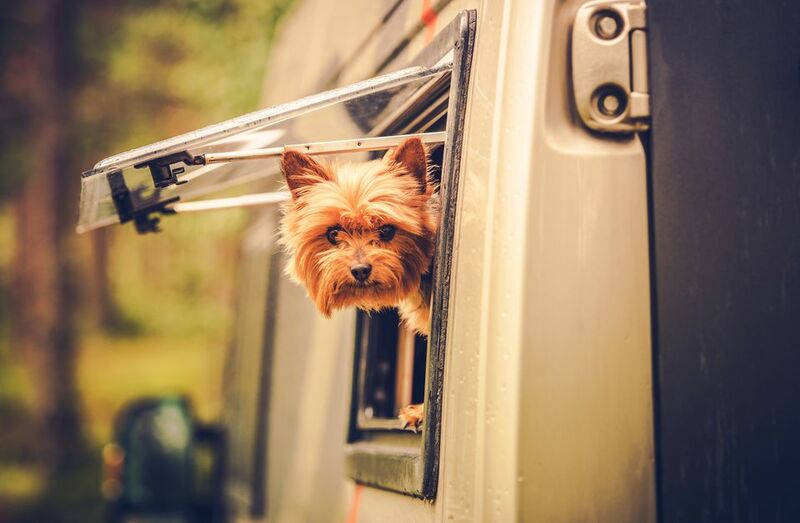 If your pet loves to come along for the ride, suffers from anxiety when you’re away, or you don’t want to board them for an extended vacation, you can always rely on dog-friendly RV parks and campgrounds to welcome them with open arms. There’s even RV parks and campgrounds across the nation that are pet-friendly and want you to bring man’s best friend with you on your travels. These seven parks will give you and them the best adventures you can enjoy together. If you and your pooch are looking for some high elevation fun, you should consider trying Garden of the Gods RV Resort in Colorado Springs. The park allows pooches and has a “bark park” where your furry buddy can run off some energy. Much of the surrounding trails and lands are dog-friendly as well, so there’s plenty for you guys to explore. This quiet park is nestled in the heart of Ohio and is an excellent starting point to explore Amish country. There are also plenty of offerings for your dog in Evergreen Park RV Resort as well. Evergreen offers up trails and open space for you and your dog to explore. They also have a dog grooming facility on site. Did we mention that Evergreen is the top-rated RV park in Ohio by Good Sam Club? You can enjoy all the spectacular sights and sounds of the iconic Big Sur along with your pooch by choosing Riverside Campground and Cabins. Riverside allows two pets to tag along and more if you let them know ahead of time. Not only are the grounds dog-friendly but many of the trails, beaches, and river access points are Fido-friendly as well. If you’ve ever wanted to hike with your best friend, Big Sur is the place to do it. This KOA is sunny central Florida has all the great amenities and features you expect from KOA and it’s an excellent spot for your dog to get some play in as well. The Lake Whippoorwill KOA has the Kamp K9 Pet Playground which is a large leash free zone where Rex can socialize with other dogs, fetch, try his paw at the obstacle course. The playground also offers shaded tables where you can relax and watch your dog go crazy. Humans aren’t the only ones who enjoy the sunshine, that’s why you need to bring your dog to the Escondido RV Resort in southern California. Escondido has a large dog park where dogs can get off the leash and be themselves. The park is completely fenced, has areas of sun and shade, a water feature and doggie water fountain. Nearby Escondido Beach is also one of the most dog-friendly beaches in the area. Talk about accommodations for your four-legged friends! Normandy Farms Family Camping Resort has plenty of ways for you to pamper your pooch or let him have fun. The resort features a 1.5-acre dog park complete with an agility and obstacle course, drinking fountains and a dog bathing area. There’s even a separate section for dogs under 30 pounds if you’re worried about rough play. If you need to leave your dog behind for any reason, Normandy Farms also has an excellent kennel facility or will take your dog out for regular bathroom breaks. Four Paws Kingdom bills itself as “The First and Only Dog Dedicated Campground in the US.” This little 34-acre site is a beautiful oasis for your pooch in the foothills of the North Carolina mountains. Four Paws offers training, events, rallies, and tons of trails and open space for you and your dog to roam. Not to mention it has continuously qualified as a top-ranked park from the Good Sam Club. There are plenty of resources available to find the best dog-friendly RV parks and campgrounds. They give you a breakdown of RV parks, campgrounds, and destinations that are dog-friendly and the amenities they offer. They go beyond what RVers are looking for, giving you options for beach getaways, events, and more. You can also learn more about traveling with dogs on both websites. If you’re not sure what amenities are available for your dog at a campground or RV park you’re interested in, give them a call and find out. Many RV parks are open to you bringing your dogs with you, but it may not be advertised. Call ahead to make sure it’s allowed, what the rules are, and if there are any breed restrictions to avoid any issues when you arrive. Whether you’re going on an extended vacation or want to take your dog along for the ride, pet-friendly RV parks and campgrounds are on the rise across the country. Don’t leave your best friend behind on your next RV trip. Take your dog on your next adventure for memories that’ll last a lifetime for both you and your pet.